I thought I'd give you another bathroom makeover to look at while I'm working on my current master bath makeover. This was the main bathroom in my old house. It was soooooooooooo bad (yes...I meant to add all of those "o"s). When we first moved in I kept the door shut so I didn't have to look at the slightly stained and cracked bandaid colored tile, or the yucky 1960's wood that was engulfing the room. There were even ants! I called an exterminator to deal with the ant problem. Then I had to work on the "pretty". I'm a big fan of Designed to Sell on HGTV and I knew I could make this bathroom look completely different without spending much money. We ripped out the tile on the floor and the countertop (it had to be done), and replaced the floor (ourselves) with inexpensive travertine-looking ceramic tile from Home Depot. We replaced the countertop with an off the shelf pre-made white counter from Lowes. Other than replacing the sink faucet, towel racks, and mirror, the biggest change in the room was paint. We removed the wood dowel things, and then painted all of the wood (including the cabinets) a nice cream color (Behr Creamy White). I then painted the room a nice neutral beige color (Ralph Lauren Cotswold Breeches). I think the whole redo cost about $400. And here she is! Oh, and a side by side comparison...just because I can't resist. Proof that you don't have to sell your young to have a prettier space :). Wow! That is amazing. I have a couple of bathrooms that need to be redone. I have been holding off because I did not want to spend a huge amount of $$$$. Now I have no excues. Everytime I see this bathroom I'm in awe!!! Its just amazing that you did everything for $400! I love it! I love this "redo"! I also like Design to Sell. Oh wow, I am amazed!!! And for less than $400!? You are a modeling maniac! Do you want to come over to my house? Ha!...I am a remodeling maniac aren't I? I guess my mom told me one too many times, "Where there's a will there's a way". I'll bet she had no idea that would mean me swinging a jackhammer :). I just found your blog through Thrifty Decor Chick and LOVE your redo! It looks soooooooo good. :) I love how it looks with the white and those bars gone. Great job! This is amazing! Great job! I too found your blog through Thrifty Decor Chick! Love the new look! I just HAD to laugh...my sister's house has almost the SAME bathroom but she has never really updated. She put a bit of new wallpaper up about 15 years ago...and that's it. I'm going to show her your improvements so may it will light a fire under her to change her bathroom. Stop it!! That came out fabulous...you must be so happy with it...enjoy!! What an amazing makeover! Great job! It looks lovely. What type of a plant is that in the corner? You did a remarkable job! Laurel - I'm laughing because the plant is a "faux" topiary I bought at a consignment store a few years ago. I wish I had a green thumb, but I CAN'T keep real plants alive. I've killed a cactus before for Heaven's sake...lol. Mmmm... love this makeover! So fresh and clean looking! Wow..that is just a perfect makeover..it looks wonderful! Wow the window looks 10 times bigger. Great makeover. Amazing! I love your "new" bathroom. You did a fabulous job. I really love the color of the paint...light and neutral. Such a great job, your hard work and creativity paid off big time. The room looks so much bigger too. Hey, AnNicole! On Friday I am featuring you as a new member of blogland, so have something great posted! I think at some time in the future you should post about your Italy trip and your mom's kitchen/dining. Geez, the pressure! OK - I'll see what I can come up with for Friday. What a difference paint makes! It looks awesome! You did a great job! It looks amazing! Beautiful job, quite a transformation! HUGE difference! It looks incredible! Great job! Fantastic! I have plans to paint my bathroom cabinets black and my kitchen cabinets white. What type of paint did you use? Oooooo, love it. Just added it to my tumblr page!!! 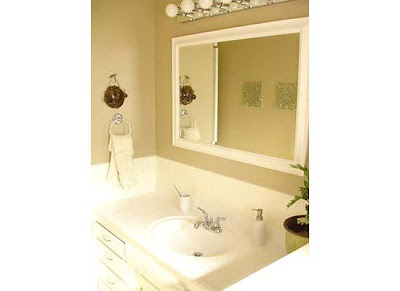 I think I'm going to replace my GREEN countertop and pain the white and gold speckled laminate vanity. And maybe just a large rug to cover the GREEN floor-but I'll need a new toilet to replace the GREEN one. What is up with people??? 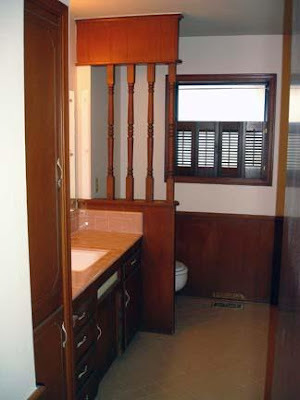 Our bathrooms must have been friends - we had those same spindles! Ahh! So much lighter and spa like! Love it! So light and clean and pretty! And cheap!! Great work. I have lots of wood this color that I wood love to paint. Thanks for the inspiration! Absolutely love your makeover! Thank You for sharing the paint colors I would to copy it, if I can convince hubby we need a change!! Thank Kim - of course I don't mind. I got the mirror at Home Depot. It was around $50 and I believe they still have them. Good luck! Holey moley, that is one heck of a transformation! I love your new bathroom, the colors are fabulous! Brilliant and amazing work! I just found your blog....and we're just moving in to our first home in September. I'll be going through your archives for ideas! Unrecognizable, the before to the after...outstanding job! Much more tranquil! Great job! Love that you were able to replace the sink with an off the shelf one. Gives me hope! That is so beautiful! I love how open and airy it turned out. wow, wow, wow! i am in love! its so soothing now! WOW!!!!!! This transformation is UNBELIEVABLE! Great job! I can't get over how great it looks! Be sure to LINK it up to my Trash To Treasures Party & adding my button! It will get you an additional entry in an UPCOMING GIVEAWAY i'll be doing! Following my blog will get you another one TOO! Happy Blogging & hope you join the party! Now that is a transformation! THats a million times better! We have an ugly 60s bathroom, no wood, other than the vanity, but the tile is UGLY. What an awesome transformation. Great job!!! Sigh. This is soooo dreamy. Love!! What a huge transformation! It is so much lighter and brighter now! Great job! I am in love. I love paint, I actually have a little obsession over the power of paint. And you proved how much it can change something. I love it so much I put this on my blog, hope you dont mind! If you are looking for a way to brighten your kitchen and give it a warm welcoming glow, cherry wood cabinets should be on your list. An inexpensive redo is to reface. You replace the drawer fronts and doors. If you get full overlay doors then most of the a bathroom cabinet frame is covered. Love the room! Where did you get that valance? 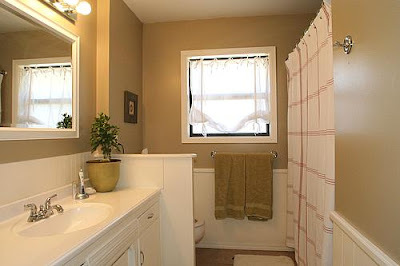 Bathroom remodel costs:-Get an idea of your bathroom remodel work costs. Zoom on the prices and square foot costs for bathroom remodel works. Wow! What a difference! 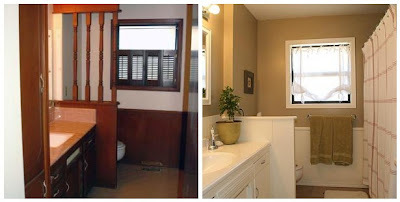 All that wood in the bathroom and dark walls made for a dark place, but the remodel makes a bright, cheery space! 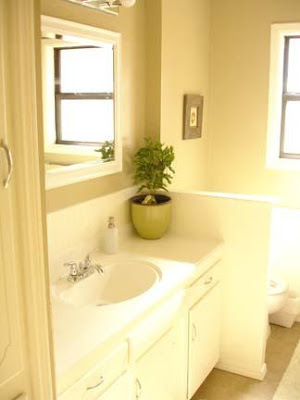 I especially like the modern bathroom vanity, you did a great job matching colors and everything! Thanks for the great post!